"Droids aren't meant to do many things, sir. I rarely let that stop me." 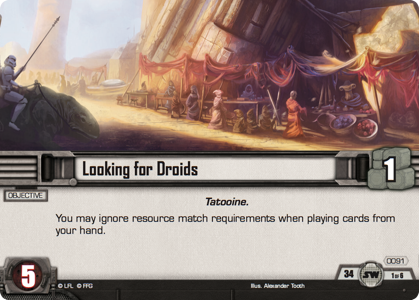 Fantasy Flight Games is proud to announce the upcoming release of Aggressive Negotiations, the second Force Pack in the Alliances cycle for Star Wars™: The Card Game! As the Alliances cycle provides you greater incentive to bring two or more affiliations together, it also explores the many friendships, partnerships, and conspiracies that have shaped and defined the Star Wars universe. Sometimes, this may lead to the formation of unbreakable new bonds, such as you could expect to grow between a fiercely loyal Wookiee warrior and a blind student of the Force should they find their causes similarly aligned. 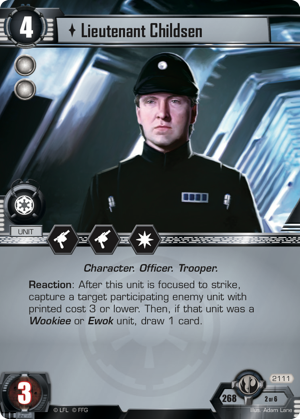 At other times, the Alliances cycle may explore the loose associations between the galaxy's underworld informants and the Imperial Troopers who rely upon their intelligence to crack down on Rebel activities. And when those Rebels—or other dissidents—are taken captive, you'll find other alliances formed. The jailers might hand the prisoners over to other authorities. Or they may hand them over to a pair of uniquely menacing and dangerous Droids. You will find all these things in Aggressive Negotiations. 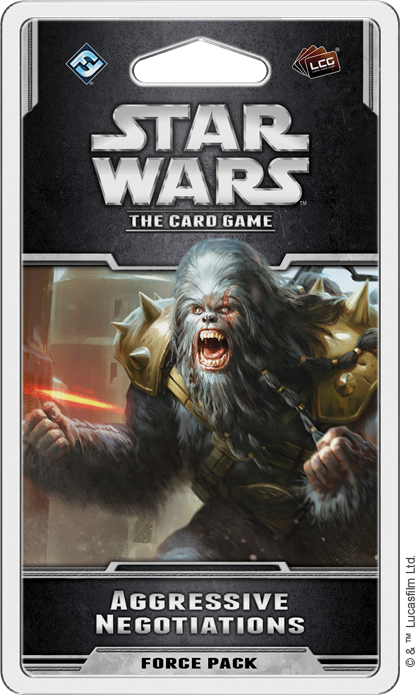 Its sixty cards (two copies each of five new objective sets) allow light side players to reach out to the Force alongside Chirrut Îmwe and the Wookiees of Kashyyyk, even as they offer dark side players new ways to hunt down their opponent's characters, take them captive, and extract whatever secrets they may know. 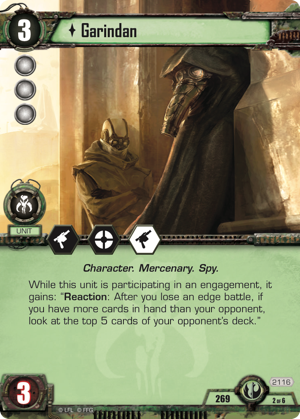 With its three dark side objective sets, Aggressive Negotiations grants us access to an interesting and deadly new crew of new Spies, Mercenaries, and Troopers. These include Garindan (Aggressive Negotiations, 2116), the long-nosed spy who collaborated with the Imperials at Mos Eisley in A New Hope, and Lieutenant Childsen (Aggressive Negotiations, 2111), the Officer responsible for Detention Block AA-23 at the time Han Solo and Luke Skywalker broke Princess Leia Organa out of her cell. And while both of these characters play into the "capture" theme that runs through the expansion's dark side objective sets, the theme truly finds its capstone through the introduction of 0-0-0 (Aggressive Negotiations, 2106) and BT-1 (Aggressive Negotiations, 2107). 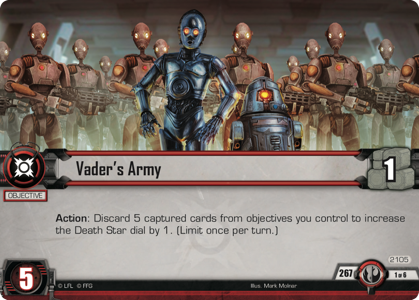 This duo of deadly droids enters Star Wars: The Card Game straight from the pages of the Darth Vader comics, in which they wreak havoc alongside Darth Vader and his associate Doctor Aphra. 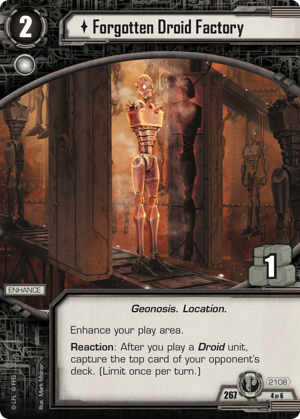 As in the comics, these Droids are ready to surprise and frustrate their rivals with a whole arsenal of dirty tricks. 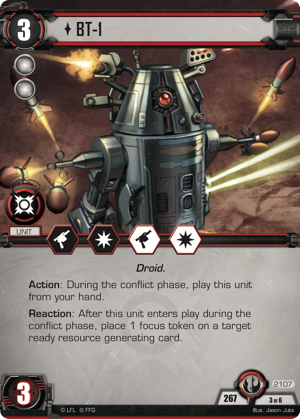 BT-1 ("Bee Tee") can deploy as an action during the Conflict phase and can shut down one or more of your opponent's resources when he does so. 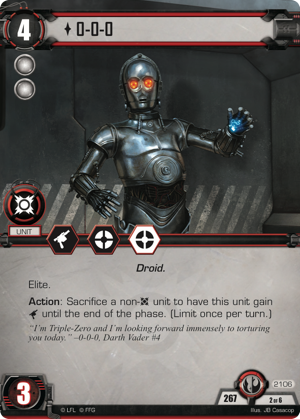 And by denying your opponent those resources, Bee Tee reduces the chance he or she will be able to respond when 0-0-0 ("Triple Zero") sacrifices a captive to gain an extra point of unit damage. 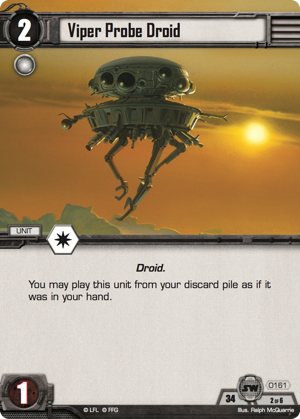 Of course, since you need to have a captive in order to sacrifice one, the Droids are likely filled with sadistic glee by the fact they come in the same objective set as the Forgotten Droid Factory enhancement (Aggressive Negotiations, 2108), which can capture a card once per turn, provided you have enough Droids to keep deploying them—or you're running the objective Looking for Droids (Core Set, 91), which comes with a pair of Viper Probe Droids (Core Set, 161) that you can deploy repeatedly from your discard pile. 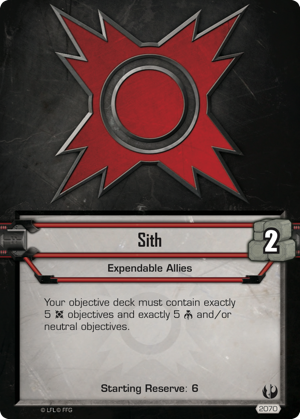 In the spirit of the Alliances cycle, you can further accelerate your ability to seize captives by allying your Sith Droids with the members of the Scum and Villainy affiliation, perhaps using the new Sith affiliation card, Expendable Allies (Allies of Necessity, 2070), or the new Scum affiliation card, Promise of Power (Allies of Necessity, 2073). And what might such an alliance ultimately do for the Dark Lord of the Sith as he pursues his secret droid army? If there's anything to be learned by the Vader's Army (Aggressive Negotiations, 2105) objective, it's that whether or not you understand Vader's motives, they're bound to leave the light side scrambling. We might think of the Alliances cycle as one focused primarily on the light side because we associate friendships and alliances more closely with the heroes of the Star Wars galaxy than with the crime lords, military officials, and despots of the Galactic Empire and the galaxy's Scum and Villainy. However, we would be wrong. 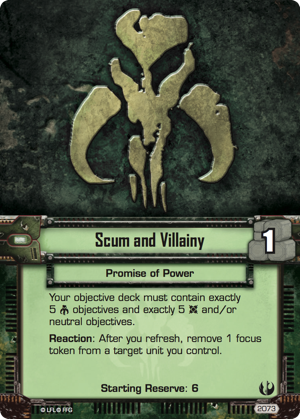 Villains such as Emperor Palpatine, Darth Vader, and even Triple Zero may not from bonds of friendship and trust with those who serve them, but they still rely upon those servitors. Sometimes, those working relationships are simple, ordered by the chain of command of a military hierarchy. Others may be shadowed by lies and deception. But one truth remains: if the relationships are properly manipulated, they can yield tremendous results. 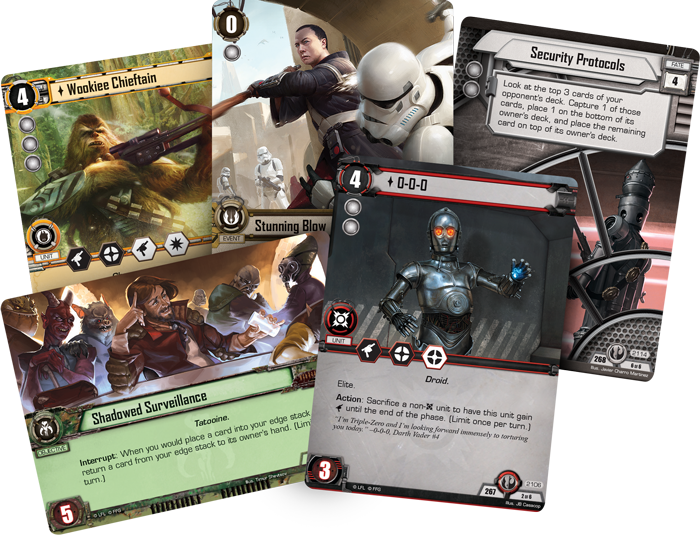 You'll find all manner of new ways to manipulate your allies—and your opponent's cards—when Aggressive Negotiations arrives at retailers in the second quarter of 2017!